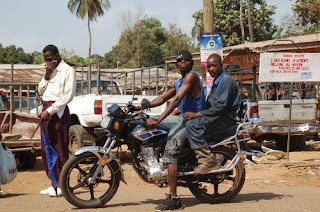 The idea blatantly stolen from Miles Estey's "Gettin' By" series, here are the economics of riding a Senke (cheap Chinese motorbike) boda-boda (motorbike taxi) for a living in Juba (taken from the South Sudan Business Week). "Meet Senke Rider Who Out Earns GOSS (Government) Staff"
John Modi started borrowing a Senke to earn a few Sudanese Pounds after arriving back in Juba from a Ugandan refugee camp, and failing to find a job. After 6 months he had saved $750, enough to buy his own Senke. "I am out of the house by 7am to drop my first client to work… I end my work at 8pm, take my supper and relax with my boys in our hood." Modi has 3 regular customers who he takes to work and back every day, giving him something of a regular wage. The rest depends on the day, and whether it is raining or not. "The income from a Senke is not regular … the tricky part of being self-employed is how to save the money. Income that comes in drips is hard to save. If one is not careful that money slips through the fingers." A standard fare in Juba is $2. Modi tries to save the money from the first 10 trips ($20), and use anything on top of that to cover his daily expenses, such as lunch ($2.50), breakfast ($2) and a "White Bull" beer at the end of the day ($1). He also gets another $20 a day from his 3 regulars, paid in a lump sum at the end of the month. "It also helps that compared to Senke business in neighbouring Uganda, in South Sudan, the costs are lower." These costs amount to just under a dollar per day for insurance, plus the one-off cost of $115 for a licence plate, and some occasional $5 fines from the traffic police. "If I had taken up a job in my management profession in Uganda, I wouldn't be earning half of this money." There is of course, unmentioned in the article, a reasonable risk of death or injury. I see a smashed-up motorbike on the tarmac on a weekly basis, and it is only getting worse as more and more roads are paved in Juba. Bumpy dirt roads at least impose something of a speed limit. Still, I'm betting that $40-$50 a day puts you pretty high in the income distribution in Southern Sudan.